The H&H Group, Carlisle, has appointed Brian Richardson, who has spent 25 years in agribusiness management as its new chief executive. 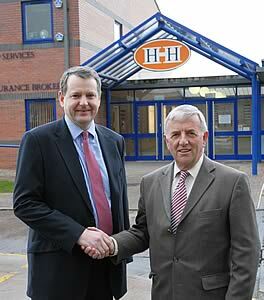 Brian Richardson, left, and Group chairman Alan Bowe. Mr Richardson, aged 47, takes on his new role at the beginning of July succeeding Trevor Hebdon, who is standing down after more than nine years in the position with the Group. A Nuffield Scholar, Mr Richardson joins the H&H Group from Lincolnshire based CWG, a traditional farming co-operative with a staff of 160 and a turnover of £20 million a year. He joined this business at the end of 2004 with the brief to remodel it and deal with several longstanding issues such as a large pension scheme deficit and declining sales. After three years, the business is now enjoying significant sales growth and has a clear focus on the future with a restructured balance sheet enabling it to look to the future with renewed confidence. Born into a farming background, he began his career as a management trainee with G Morrell and Sons, Harrogate, an agribusiness covering several business areas. After progressing to commercial manager, Mr Richardson took up a similar post with the farming and estate management group JSR Farming Group in Driffield in 1982. He was appointed a director in 1986 and became Group managing director in 1992. During his 15 years with the JSR Group his role developed and he was ultimately chairman and managing director of JSR Healthbred, the internationally renowned pig genetics business. From 1998 to late 2004 Mr Richardson was chief executive of Woldmarsh Producer, an agricultural buying co-operative based in Lincolnshire. During his time at Woldmarsh he increased turnover from £25 million to £50 million and significantly increased its membership and geographical coverage. During his career he has demonstrated an in-depth knowledge of strategic development of agricultural related businesses through working to deliver customer requirements as well as tight financial controls. In 1999 he was awarded a Nuffield Scholarship to investigate agricultural co-operation overseas, visiting Northern Europe and New Zealand. His report was presented in 2002 with the information used by many co-operative organisations in the UK. As well as his business activities, Mr Richardson is a past chair of governors at Louth Grammar School, only recently standing down in 2007. Mr Richardson is looking forward to his latest challenge with the H&H Group. “Trevor Hebdon has left the Group in good shape financially with a strong balance sheet and I look forward to working with the business managers to further develop the Group. He currently lives in Louth, Lincolnshire with his wife Sandra and two daughters Emma, aged 20, and Laura, 17, and he is looking forward to making his new home in Cumbria. Outside work he enjoys many rural pastimes and has recently started to learn to play golf.